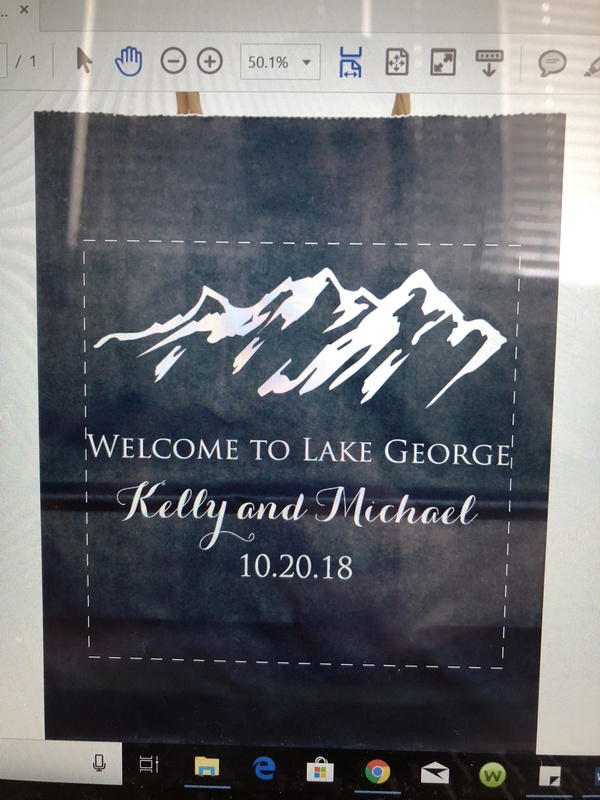 Make your out of town wedding guests feel at home with 8 x 10 hotel gift bags personalized with a wedding design and up to 4 lines of custom print filled with goodies and placed in each hotel room. A unique message printed on your bags will let each guest know how much you appreciate them. Fill your bags with water bottles, sunscreen, snacks, and any other items that will make your guests comfortable during their stay. These medium sized bags measure 8 inches wide by 10 inches high by 5 inches deep and are made of heavy, quality Kraft paper that won't tear under a heavy load featuring twisted handles for easy carrying. Choose from a variety of bag colors to match your wedding theme and personalize your bags with a design or monogram and up to 3 lines of text in your choice of lettering and imprint color. To mix and match lettering styles, just enter in the special instructions box below. The gift bags were adorable. The bags were the perfect addition to our wedding weekend and a great reception happy for our guests when they arrived to check in at their hotels. Thanks so much! I was having a very hard time finding a company to make my aftercare bags for my tattoo shop. Every place I found was either too small, too expensive, or didn't do custom printing. Although the page is designed more for weddings, I was able to use the monogram selection to add my companies initials, and they allow two lines for whatever you want to write which worked out fantastic because I was able to add the shop name on the first line under the monogram, and aftercare on the second. I purchased 160 bags to receive the best discount and for the cost I wasn't expecting the highest quality. To my surprise, they well exceeded my expectations and I couldn't have been more impressed. The bags arrived the date they specified at the date of purchase as well which was also a surprise! Whether or not you need them for your business or for a wedding I would highly recommend ordering from them. Given the vast custom options and high quality I am confident you will be just as satisfied as myself! The quality of the bags I purchased were beyond my expectations! I recommend this company and product to everyone. The bags arrived when promised! Thank you so much! Our welcome bags came out exactly how I expected. It was so easy to do. Just fill in the blanks and and pick colors and it's done. Also, bags were shipped 1 week earlier than estimated. Such amazing beautiful bags!! Can't wait to use them at the hotel for the wedding!! This company did a great job create them!! I thought these bags were so adorable and just what I need to welcome my family in October for our Wedding..........BRAVO I loved everything about these bags!! I visited a local craft store to purchase bags and stamp them myself, but the bags (in sets) were wrinkled, and just not right for wedding gift bags. I was pleased to find this company, and have them do the work. I loved that I could view the proof before ordering. The bags came in no time, and they're beautiful, crisp, and perfect! I love that you can see what the bag will look like, and the proof was spot on! The bags came in a timely fashion and are exactly what we needed. The bags are beautiful and came very quickly. I'm very pleased with the quality and how pretty they are!! I have ordered 3 different times from this site and I must say it's the easiest thing I have ever done, the [company] is very professional & the product was really great, I ordered the bags for our out of town guests at my son's wedding in March, I will definitely order again, so very pleased, no hassles, I'm really impressed & thankful, keep up the good work. Bags were sturdy n nice size for all I wanted to put in them for our guess. Delivery was timely. I would do business with this company again. Well worth it. Really cheap and gets here fast. Would definitely recommend it to anyone. Bags came in and look beautiful. Very happy with the quality. The guest bags are beautiful and arrived sooner than expected. These bags are amazing! Great quality, very strong and sturdy. We placed two drinks plus snacks in each bag they handled the load without issue. I am so happy with my hotel guest wedding day gift bags.They are nice quality and are a nice size for waters, snacks and goodies for our guests. These bags turned out just as I pictured! They are going to be a perfect welcome for all my wedding guests. I want to thank you so much for working with me. My first order was stolen from my front porch and you rushed my second order so I had them in time to prepare them for the wedding! The bags are perfect! They fit a lot of items and they are very sturdy. I will order again! Our wedding hotel bags were perfect! They were exactly how they were described when I ordered them! These bags came out wonderfully and were done quickly! They are perfect for our wedding welcome bags. I also really like all of the different options! It was so easy to order the hotel gift bags for the wedding - personalized and shipped quickly. Arrived with weeks to spare. They will be a nice touch for the wedding guests and very affordable. Quality made gift bags. Bought these for my daughter's wedding hotel guests. Writing on bag was excellent! Loved the idea you could customize and had a nice choice of designs and colors . Fast shipping arrived earlier than expected! Would definitely recommend and shop again! Bags turned out perfect, just as advertised.